Ah, there it is … at last I catch the scent of the place. Peppery, leafy, smoky, fresh, salty, sweet, tangy – yes, tangy and definitely exotic to someone from the north of England. I am standing on the edge of lush rainforest beside a beautifully twisted, gnarled tree with fronded leaves and vibrant scarlet flowers. The Flamboyant Tree (or Royal Poinciana), national emblem of St Kitts, tiny island in the West Indies, gives an exuberant welcome on my first visit to the Caribbean. 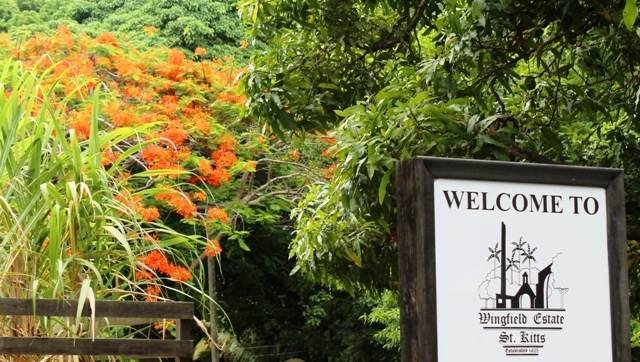 The rainforest is part of the Wingfield Estate, owned by Maurice Widdowson, originally from Lancaster. There’s a unique industrial heritage open-air museum being excavated on land that was used to produce tobacco, cotton, sugar and rum. In the beautiful old plantation house, Romney Manor, is Caribelle Batik, where we learnt how to make batik. This walk is a sensory delight. 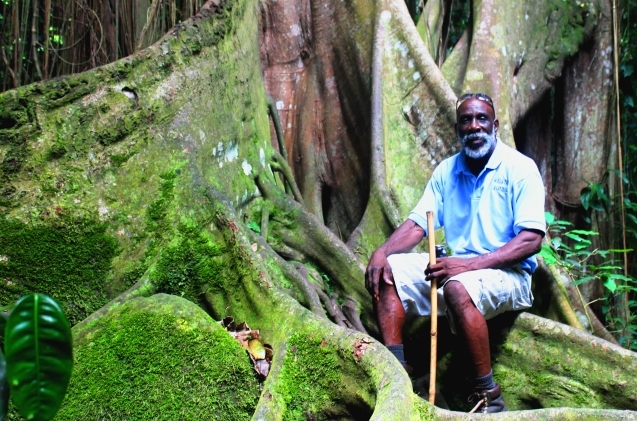 Zarina McCulloch, Chrissie Walker and I are led by O’Neil Mulraine, local guide and enthusiastic advocate of St Kitts rainforest. Green velvet monkeys screech high up in the canopy. They peer down, waiting for us to disappear so they can return to scrumping the ripening mangoes hanging temptingly from heavy branches. 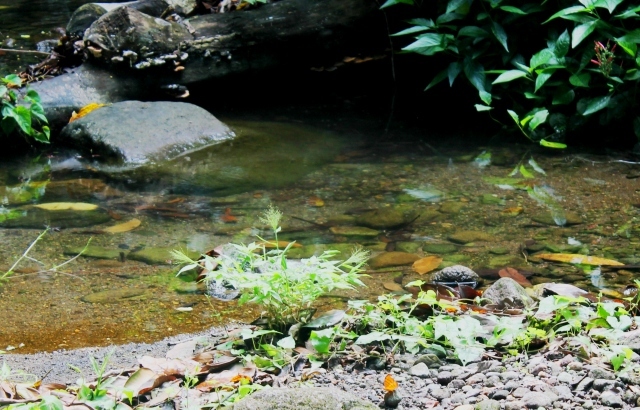 The Wingfield River trickles over age-smooth rocks, pebbles and boulders and tiny fish dart from sun to shade over fallen leaves littering the river bed. Burnt orange butterflies flitter about with gay abandon and a hovering humming bird aims for a direct hit into a deep purple flower. Ahead strides O’Neil, enthusing over the glories of this natural paradise. Every so often he stops to tell a story about the track on which we are walking or use his stick to point out a leaf that has healing properties. O’Neil has created his own path through the undergrowth and knows every inch of the way. 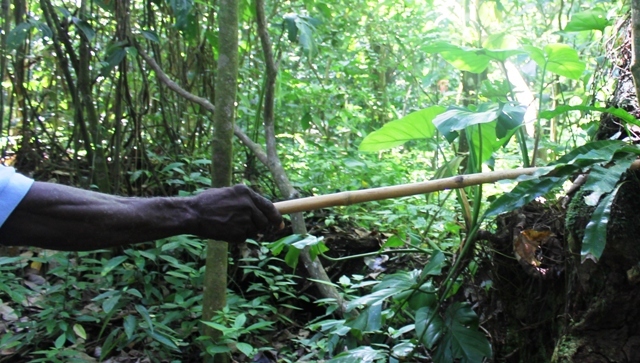 He shows us a little plant that is rainforest Viagra and another that makes healthy bush tea. 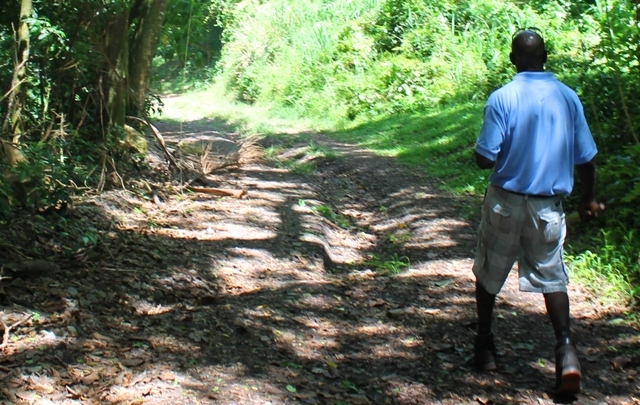 This area is now a national park and locals are slowly discovering the joys of a walk in the rainforest. Soon we are scrambling over rocks to the other side of the river to look at the gorge wall that has been carved out of the massive hillside. Standing in the shade of the red rocks, warbling birdsong drifts through the dense foliage; unfamiliar and hauntingly lovely. 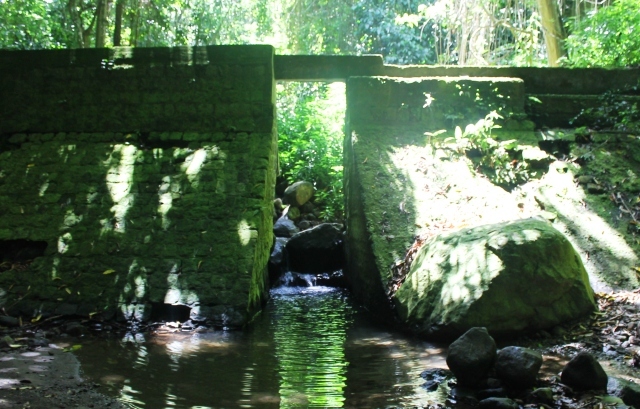 An imposing dam and bridge are built over the water. Apparently it was made by slaves in the 18th century to control the flow for the water mill on the Wingfield Sugar Plantation. 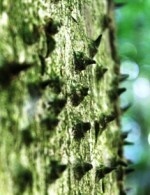 We’re warned to avoid the jaggy bark studded with vicious looking spikes. O’Neil tells us it’s the Kapok tree (Ceiba Pentandra), which grows to an enormous height and produces long, strong fibres that have been used for hundreds of years to fill jackets, mattresses, pillows, dolls and other household items. 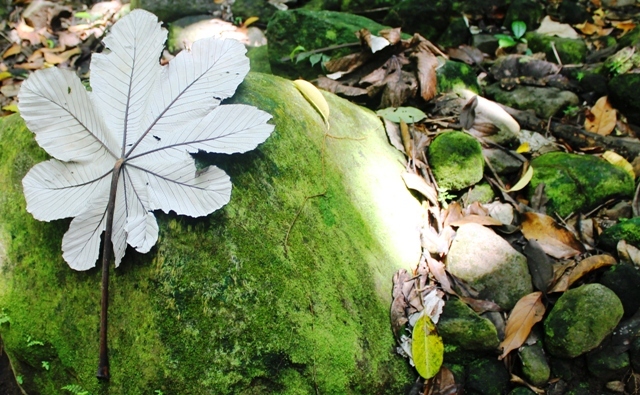 As we start to make our way back we find enormous leaves littering the ground – green on one side and white on the other. O’Neil says something about it turning white when rain’s due, but as it rains almost every day at this time of year, not sure if I have heard right. Whatever the reason, Chrissie picks one up, places it on a rock, we take photos and then I use it as a fan. The late morning temperature is increasing, humidity is rising and the Caribbean heat is starting to make itself felt. And so we finally leave this peaceful haven, one of the world’s very few ‘growing rainforests’ and a place where nature is permitted to show her ability to not only look gorgeous but also provide mankind with invaluable natural wealth. 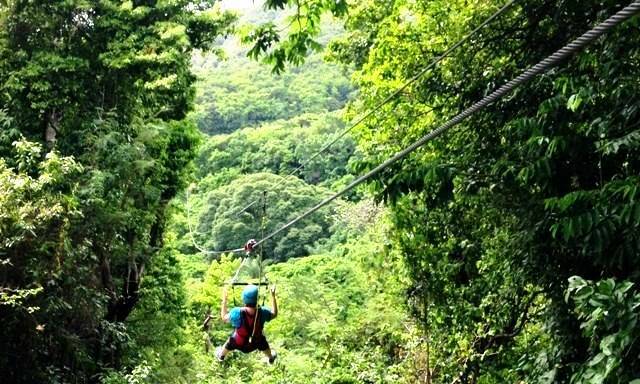 O’Neil gave us a brief glimpse of St Kitts rainforest in all her glory that I am sure none of us will forget. 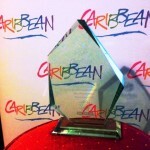 I stayed at the luxurious St Kitts Marriott Resort Hotel and was hosted by St Kitts Tourism. 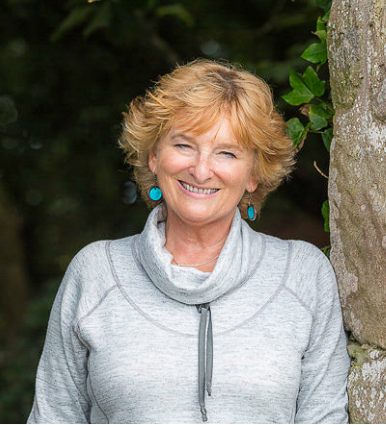 Special thanks to Zarina McCulloch for organising such a fascinating introduction to the delights of St Kitts, a truly charming Caribbean island. 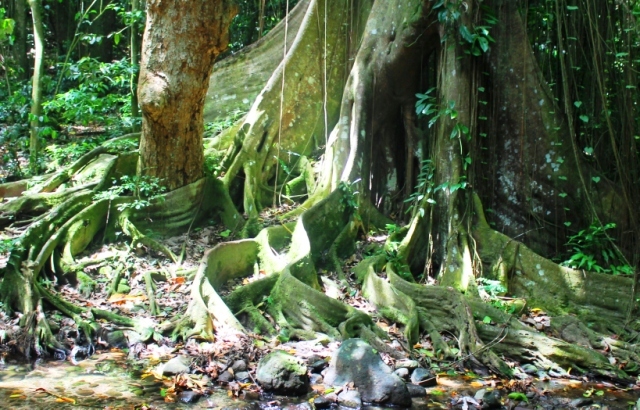 Apparently this is one of the very few rainforests that is actually increasing in size. Most of the ones in South America are decreasing due to deforestation for commercial purposes. It’s so heartening to see this beautiful natural habitat being cared for and encouraged to grow. As you know I’ve visited St Kitts. I am so pleased to see its hidden delights being brought to the world. It looks beautifully lush – what stories that forest can tell! You can almost smell the Caribbean tang here – looks a great place for a walk, and seeing a monkey makes it extra special! The monkeys were very shy and kept far away from us but we could hear them crashing through the trees. O’Neil said they are very mischievous and the farmers don’t like them as they eat their crops. They’s very elegant with long arms, legs and tails. You’re so lucky to go there. I want to visit the Caribbean now! Une sacrÃ©e leÃ§on de vie et de beautÃ© – Ce “sage” bienveillant qui a partagÃ© avec vous cette somptueuse St Kitts raintforest redonne le sourire. Oui, il y a encore des “paceful haven” sur cette terre ! !